Introducing Cat Match, our brand new app which allows players to run their own simulated Cats Protection Homing Centre. With the help of a virtual vet, players must care for the cats in their centre and get them ready for rehoming. The game features a mix of Match-3 puzzle mechanics and lite Sim Management to give a fun take on running a real homing centre. 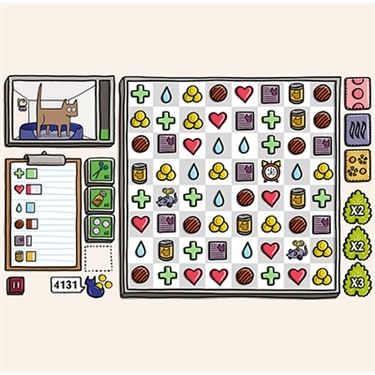 By matching icons in a row, essential items can be gained for the cats including food, medicine and virtual coins which enable the build of additional blocks to home even more cats. All profit from in-app purchases goes directly to help Cats Protection. We’ve recently released an update on the app – players will now receive free coins at regular intervals and we’ve fixed a bug which was causing crashes for some. Cat Match is kindly sponsored by Feliway®.